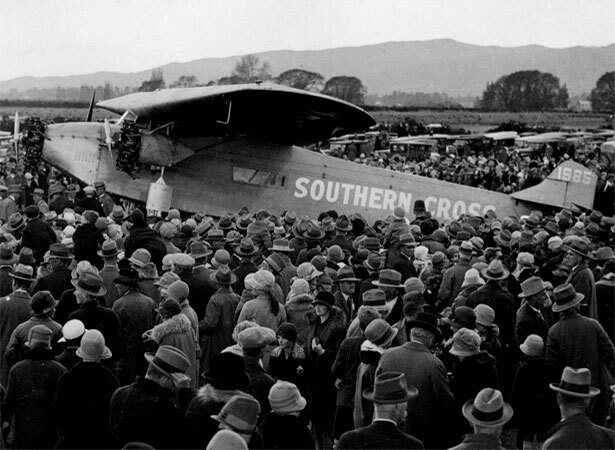 Australian pilots Charles Kingsford Smith and Charles Ulm crossed the Tasman in a Fokker tri-motor named the Southern Cross, covering 2670 km in 14 hours 25 minutes. New Zealander T.H. McWilliams, a teacher at the Union Steam Ship Company’s radio school in Wellington, had joined the four-man crew as radio operator. Though the flight had been postponed for a week in the hope of good weather over the Tasman, they struck thunderstorms throughout the night. While McWilliams struggled to repair the radio equipment, which had failed shortly after take-off, Kingsford Smith was forced to fly blind for much of the journey as heavy rain or ice coated the windshield. As they neared New Zealand the weather improved, and after circling over Wellington, the Southern Cross landed at Wigram Aerodrome, Christchurch at 9.22 a.m. (New Zealand time). The welcome in Christchurch was tremendous. About 30,000 people had made their way to Wigram, including many pupils from state schools, who were given the day off, and public servants, who were granted leave until 11 a.m.
We have 9 biographies, 1 article, related to First trans-Tasman flight touches down.